Uranus is the third largest planetary member of the solar system and is the seventh planet from the Sun. Its orbit is slightly elliptical and lies between those of Saturn and Neptune. Uranus has a mean distance from the Sun of about 2871 million kilometres, placing it about 19.2 times further from the Sun than is Earth. It travels around the Sun once every 84.01 years, and rotates on its axis with a period of 17 hours 14 minutes. The planet's atmosphere rotates faster than its interior. The fastest winds on Uranus, measured about two-thirds of the way from the equator to the south pole, blow at about 720 km/h. 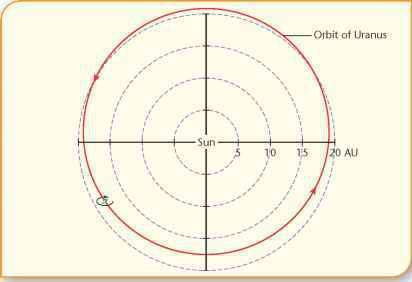 Figure 11.2 Orbital path of Uranus (distance circles are in astronomical units, AU). planet appears to be tipped on its side. 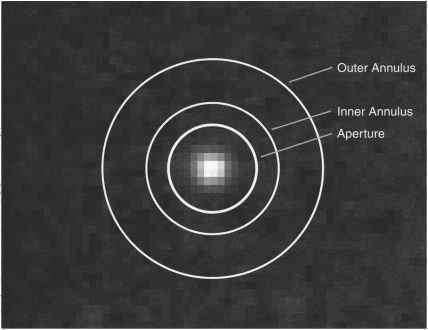 It is not known why Uranus has such a high axial tilt, but it may have been hit by another large body sometime in its past. At the time of Voyager 2's fly-by, the planet's south pole was pointed almost directly at the Sun. As a result of this, Uranus's polar regions receive more energy from the Sun than its equatorial regions. However, the temperature is still higher at the equator than at its poles, for unknown reasons. Uranus's spin is also retrograde, meaning it is spinning in the opposite direction to most other planets.